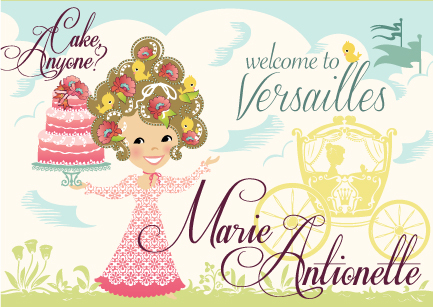 Call it a sneak peek or a spoiler, but this is a sweet peek at a new collection I am working on with Lettering Delights. 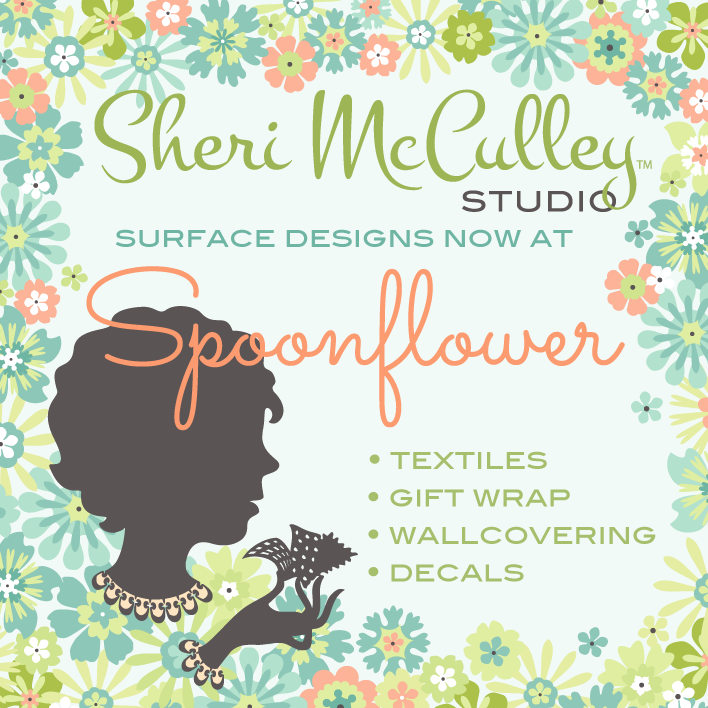 I had such fun working on design and decor ideas for the Cut Flowers collection we did last spring. 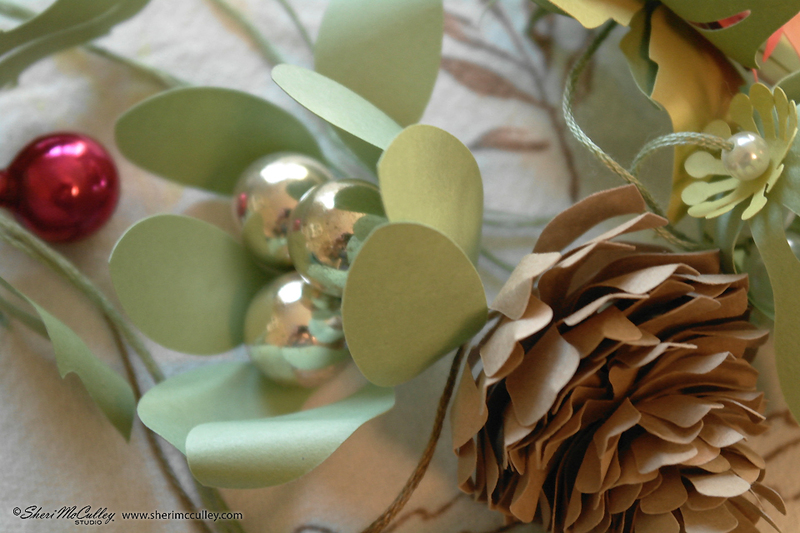 It just seems the natural next step to have a Cut Flowers Holiday collection for crafters to create with as the season approaches. 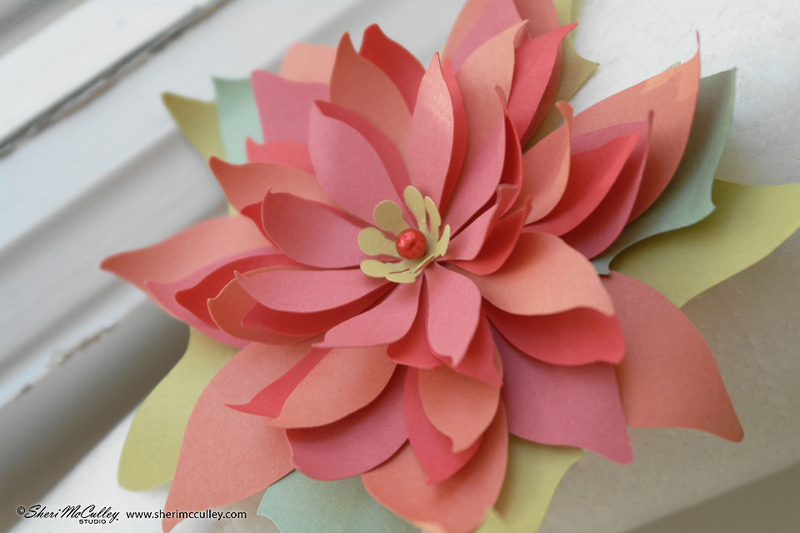 This collection will include the traditional floral and evergreen icons, all from nature brought to paper. 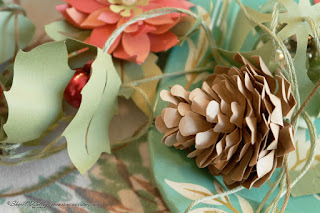 The rich reds and pinks of poinsettias, the greenery of holly and mistletoe, the natural texture of pine cones, and the crispness of paper whites will come together this season as little works of art. I will be sharing ideas for gift giving, card designing and holiday decorating. I will also share tips and trick for papercrafting specific to this collection. 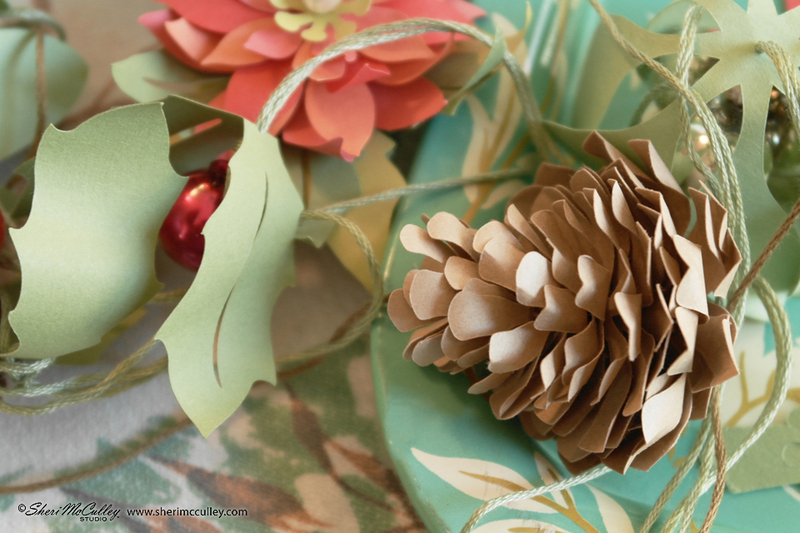 The collection won’t be ready for a few more weeks, but start thinking of your own creative uses for this new sequel to Cut Flowers, the holiday collection. I will let you know when the collection has changed from a sweet peek to a Friday favorite on Lettering Delights. Prepared to be spoiled! 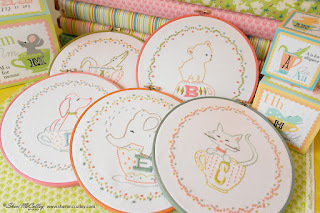 Don’t you just love this Alpine Wonderland fabric line?? I do!! Can you tell?? 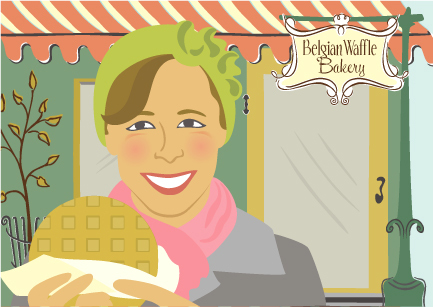 Brooke here once again with another fun project. I thought tree blocks would coordinate nicely with the tree print from this line. My runner or wall hanging is 18 x 43. I paired up prints to be my trees. I used a solid white for the background and a piece of brown grunge for the tree trunks. I used magic corners to achieve the trees. Here is my completed top. I used 3.5 inch strips for the border. 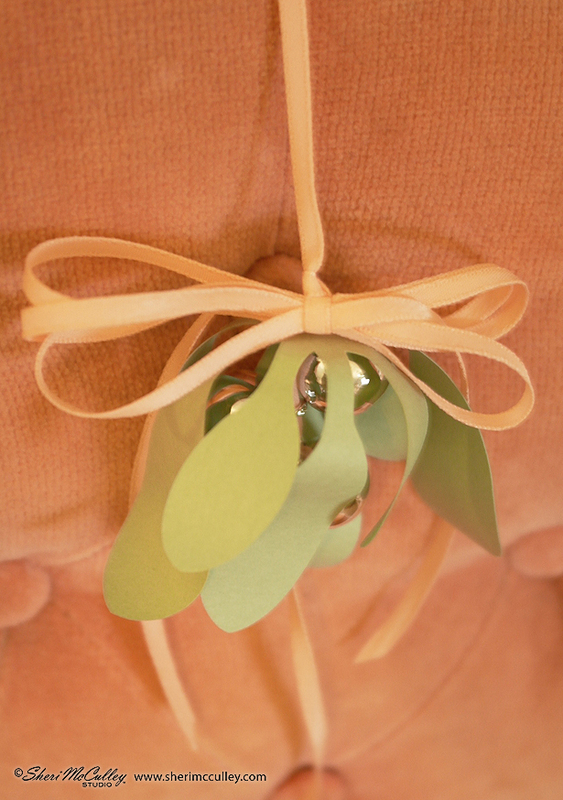 *Note* the tree print is directional, so it does require some attention to detail to cut out. Getting ready to quilt . . . I began by quilting the trees first and working my way out. Quilting done . . . this picture has a neat effect to it . . . ready for binding. Since I was undecided about if I would use this as a tablerunner or a wall hanging, I went ahead and attached a small sleeve so I could do either. Another close up view with binding and all set to go. Happy Holiday sewing! See you next time . 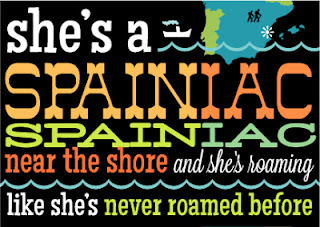 . .
As many of you know my daughter is spending the year in Spain. 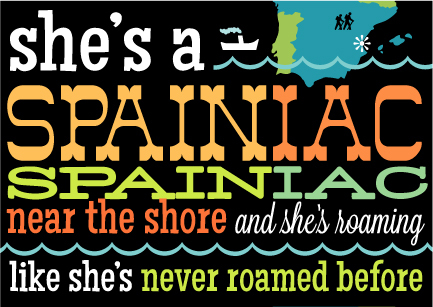 Well, let me rephrase that, she’s spending a few weeks at a time in Spain, then off to other European countries on trips, then back to Spain to learn a bit more, and then off again. Now, I’m not one to encourage sending the college kids off to play for the year. In fact, I’m not so much about that. But this is an opportunity for her to learn Spanish fluently, learn about many other cultures, history, geography and frankly to learn that this old world isn’t so big after all, but it is filled with variety and diversity. Oh, and a major lesson she is learning is how to be completely on her own and figuring in out as she goes. That life lesson is somehow better to learn in a foreign land. We are able to follow her experiences, travels, tears and joys every few days as she blogs about her time there, and everywhere. :) She is an excellent writer and photographer and makes each experience seem as if we are right there with her as we read her blog. It makes this mom feel comforted to know how she is doing, be it good times or bad times (and she has already had some rough ones). It’s not easy to communicate, even with today’s technology, so we still happily snail mail packages, letters, and cards across the deep blue in hopes of them reaching their destination before the year is up and she returns home. As some of you also know, when she started college I would design and send her and her friends a post card each week. That was fun for me and it put a little something in the mailboxes of the kids each week. 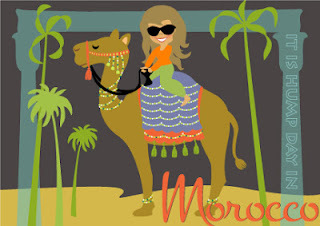 Well, I am attempting to do this again and with her many travels I have lots of visuals to work with. 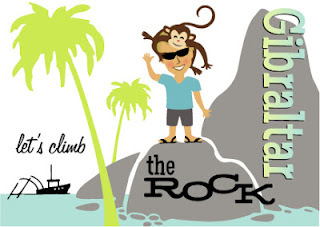 I shared one post card on my blog of her and her cousin in Gibraltar a few weeks ago (he’s the guy on “The Rock” postcard). I thought it would be fun to show you the other places they have been in the last month (or at least a few of the places and palaces). She sends me postcards of the landmarks, then I send her my visual translation of those places. It’s fun. 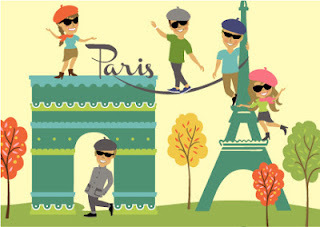 Hope you have fun translating these images into your own ideas of these European locations. Happy travels! 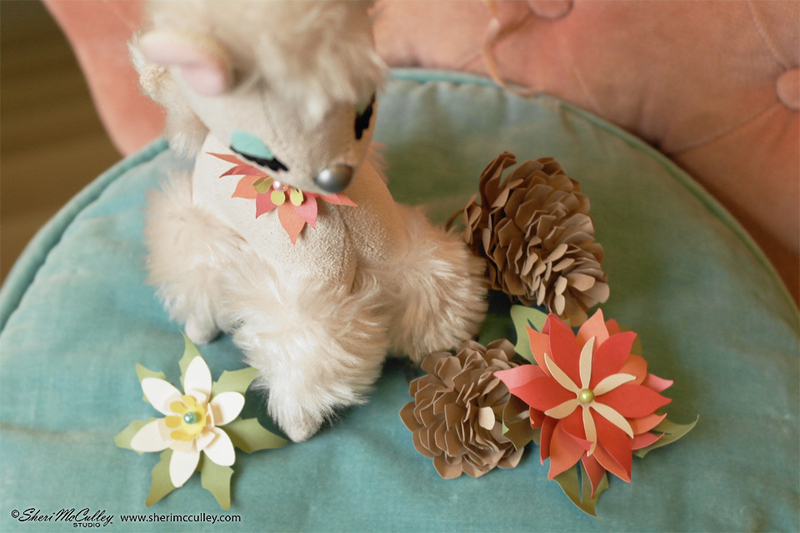 Above is an example of the seven pages you will receive in the PDF pattern. 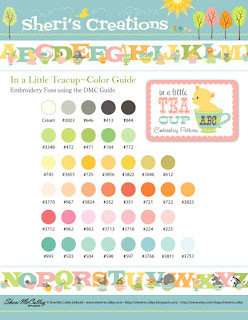 When you get the pattern, you will also receive art for the teacup animal without the letter, as you see in this sample with the bear on the teacup and no “B” on the cup. 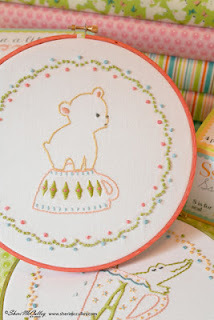 This allows for variety in the collection, as many of you will have favorite animals to embroider, but may not want letters in the completed artwork. 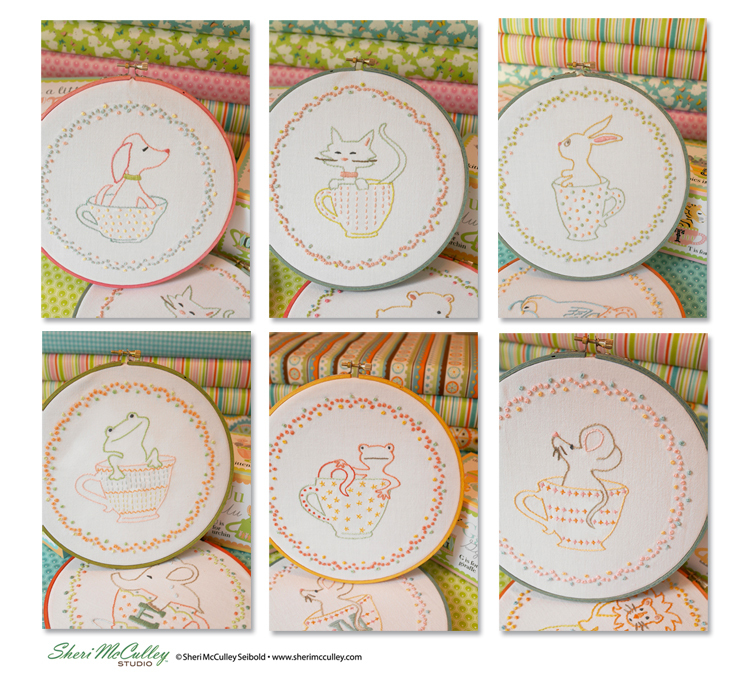 These little teacup animals are perfect for so many baby and child projects, but I think they are equally useful and fitting for pillows, wall hangings, quilts and tea towel art. 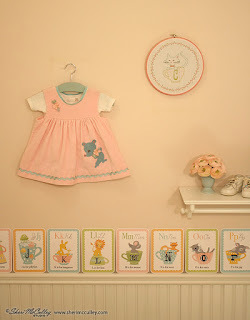 Who doesn’t love the teacup theme? 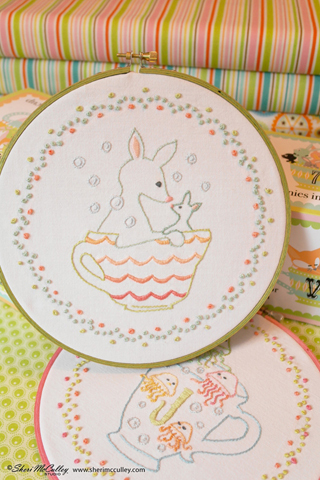 Since these patterns allow you to embroider the teacup scenes without the alphabet letters, you might enjoy creating your own sets of pets, sea animals and safari animals, or just your favorite animals. This is the pet collection: cat, dog, mouse, rabbit, frog and newt. 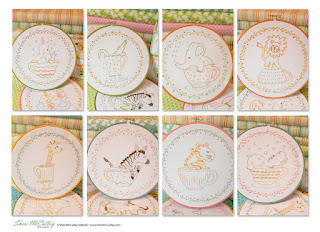 Note, I am showing these patterns with the animals and teacups but without the letters, as an option for your needlework. This is the sea creatures collection: whale, jellyfish, seal, otter, sea urchins and x-ray fish. 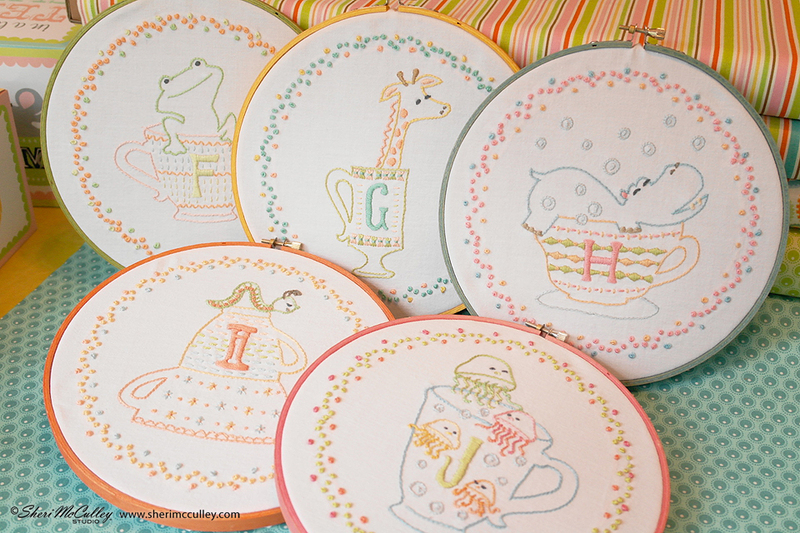 I am showing these patterns with the animals and teacups but without the letters, as an option for your needlework. This is the safari collection: alligator, elephant, giraffe, hippo, kangaroo, lion, tiger and zebra. 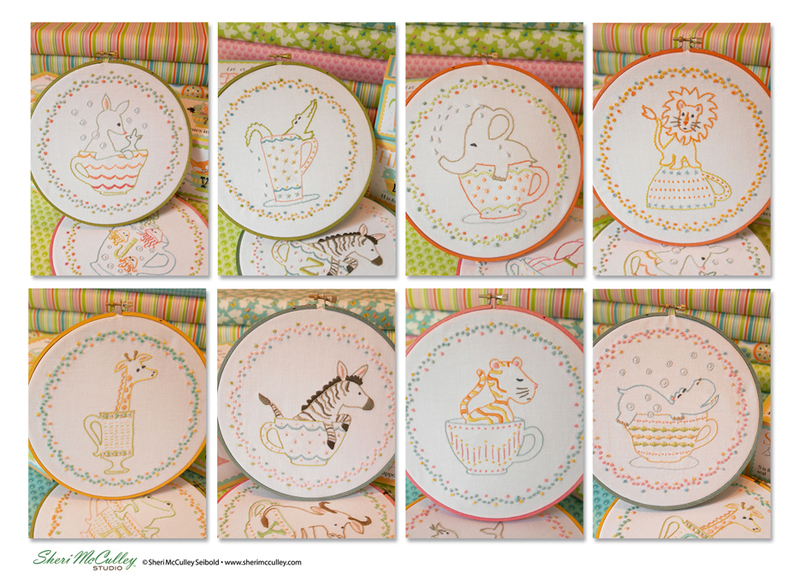 I am showing these patterns with the animals and teacups but without the letters, as an option for your needlework. Just think of this as 26 ways to create your own embroidery projects and give the gift of handcrafting to all your favorite creatures in your life. You can review each pattern in detail at my Etsy shop. We are going to begin with the advent calendar panel. Using the lines marked on the panel, fold and iron each row in place. I did use a few straight pins to hold the rows in place as I went. Once all the rows are ironed in place, I sandwiched with batting and backing ready to quilt down the pockets. Using my walking foot, I quilted along both the horizontal and vertical lines of all the rows below the “Merry Christmas”. I began the vertical row quilting at the bottom of the calendar toward the top. In this picture, you can see the stitched pockets. I did a simple meandering at the top of the calendar. Using the printed lines as a guide, I trimmed away the excess as shown. Before binding, I cut a piece 3.5 inches wide and finished the ends and centered it on the back of the calendar. This will be a hanging sleeve so the calendar can easily be hung up on the wall. Next I made binding with a coordinating print from this line. After handsewing done the binding, your calendar is finished - doesn’t it look so nice?! Here it is up on the wall...sorry about the poor lighting....sometimes the weather doesn’t cooperate with my creating timeline! I took the softie pre-printed panel, sandwiched it with batting and backing and did some free motion quilting. Using pinking shears, I cut out my softies. 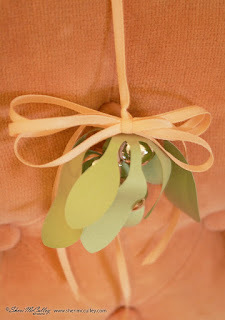 I used the advent calendar as a guide to make sure the softies could fit inside the pockets. I decided after I was done using my softies in the advent calendar, I wanted to hang them on my tree, so I sewed 12 inches of tiny ric rac to the top of each one. I really love how cute these look! At my house, all these cute softies would get lost or separated, so I thought a cute drawstring bag was in order. I cut a piece 12.5 x 24 and folded it in half. I used a .5 inch side seam to make forming a casing easier. I folded down 2 inches from the top for the casing. Now my softies have this nifty home! I hope you have enjoyed this step by step guide for transforming your printed Alpine Wonderland advent calendar and softie panel into this adorable Christmas keepsake! Happy Holidays! Happy sewing! Embroidery from A to Z, come stitch with me! I have been working on the In a Little Teacup embroidery collection for exactly four month and I have just finished the last letter to complete the alphabet. This has been one of my all-time favorite projects to work on. I have not embroidered since I was a teen, so this has been an enjoyable craft to revisit, and it is quickly becoming a nightly routine. 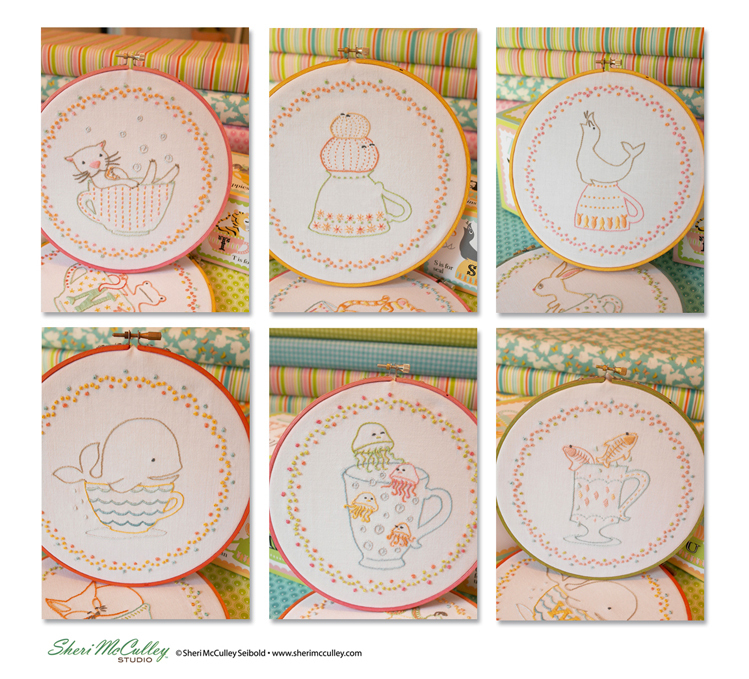 Now it is time to make these designs available to you as individual embroidery patterns. 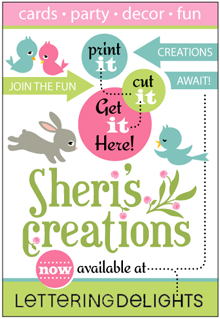 They will be available in my Sheri’s Creations shop on Etsy by early next week. 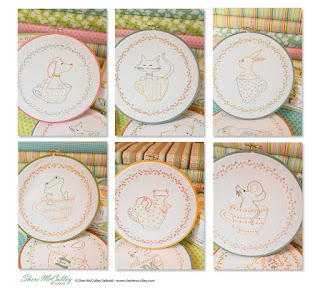 I hope you will visit the shop to view each of these individual patterns as well as the other In a Little Teacup products that coordinate with this set. 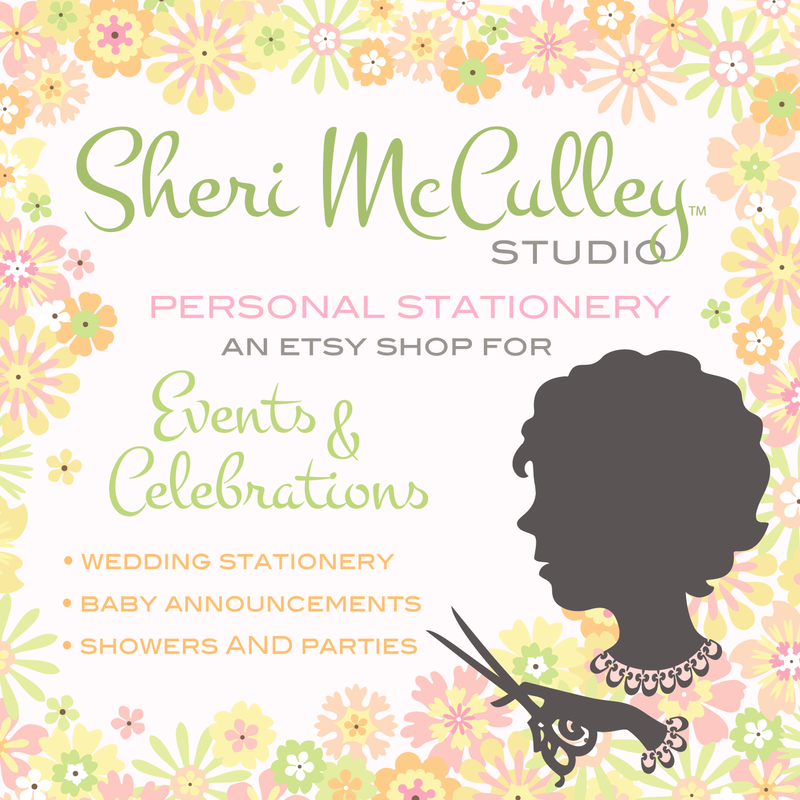 I am also planning to make available personalized prints and baby announcements with this theme, so keep watching the shop to see what is new each week. 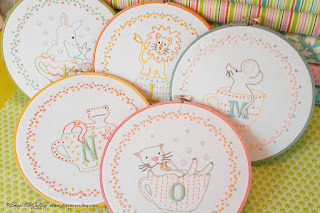 These patterns are fun and easy to embroider. The designs fit into an eight inch hoop, and as you see, they can be left in the hoop for wall hangings. 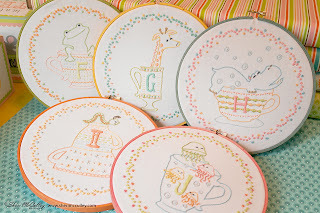 I have chosen to dye my embroidery hoops and will share a “how to” on this in a future blog posting. 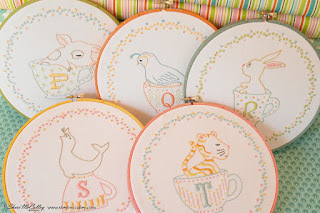 These would be darling for a baby or child’s room in sets of initials, or even the child’s name spelled out, displayed above a crib or cozy reading area. 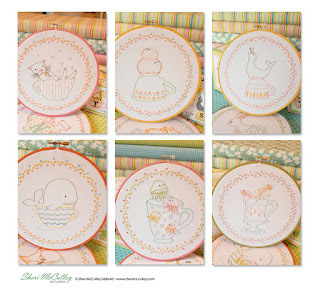 This set would also make a lovely keepsake quilt. 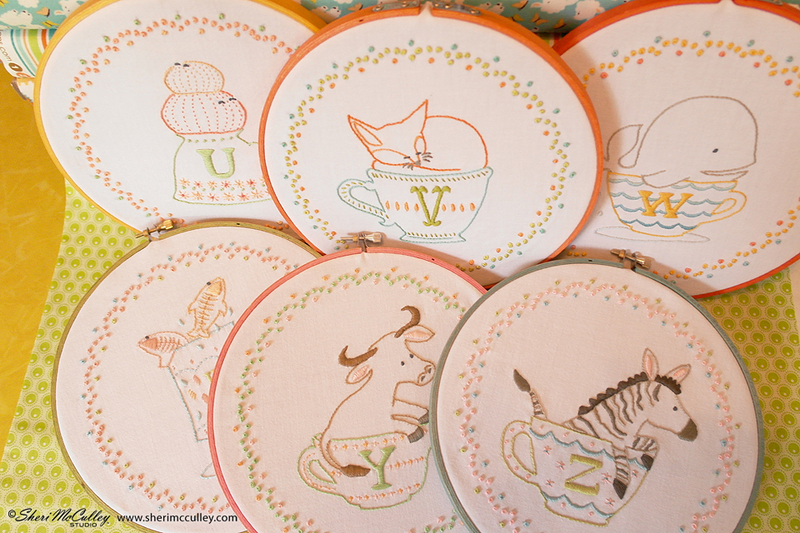 Oh, and there isn’t a tea towel out there that wouldn’t cute up a kitchen more with a few of these charming teacup animals stitched onto it. 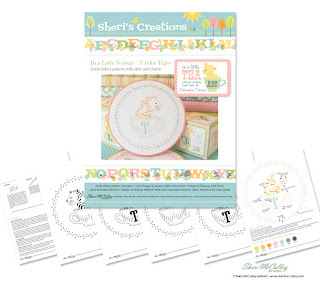 The patterns will come with stitching instructions, a color guide (although you might like to color coordinate for your specific style), transferring instructions, as well as the designs with and without the letter in the teacup (for those who like the animal, but do no want alphabet letters). 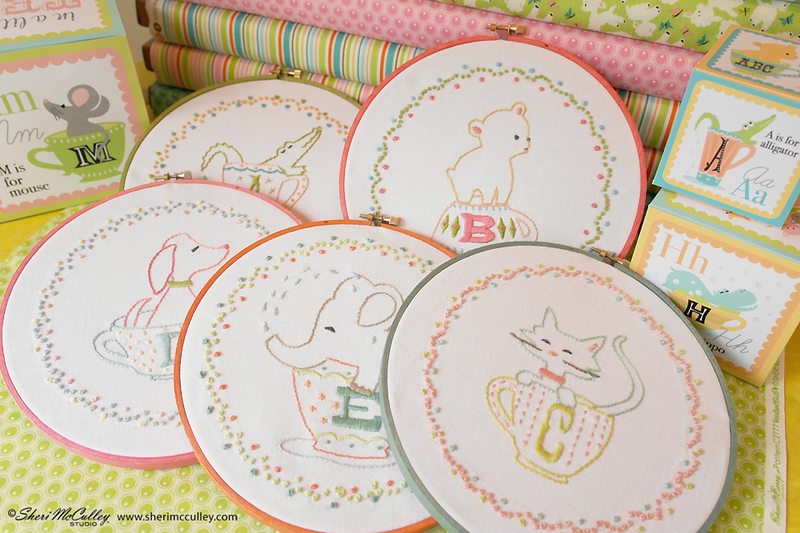 I now plan to create many more of my designs into embroidery patterns so if these little animals are your cup of tea, wait a few more weeks and you might find just the designs you are looking for to embroider into your own creative needlework. 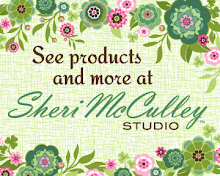 In fact I would welcome ideas and interests you have for future embroidery patterns based on the many collections I have created. 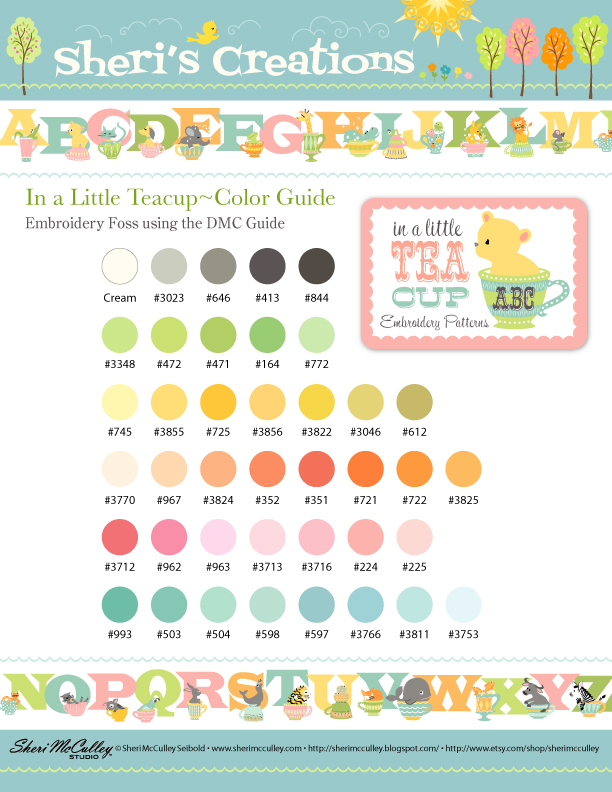 You might be interested to see the color guide I used for these teacup patterns, in case you want to have the threads on hand. These are all DMC embroidery flosses. 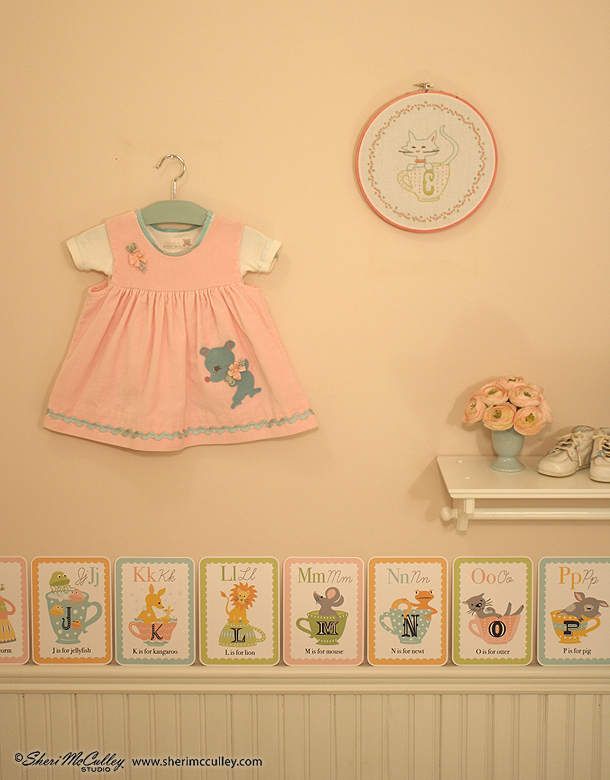 Here is a snapshot of a little girl’s room with a wall hanging of embroidered cat in dyed hoop, and alphabet cards lining the room. I will post again as soon as I have these embroidery patterns on my Etsy shop, so you will know when and where to get the downloadable files. (To see the other products already available in my shop go here.) 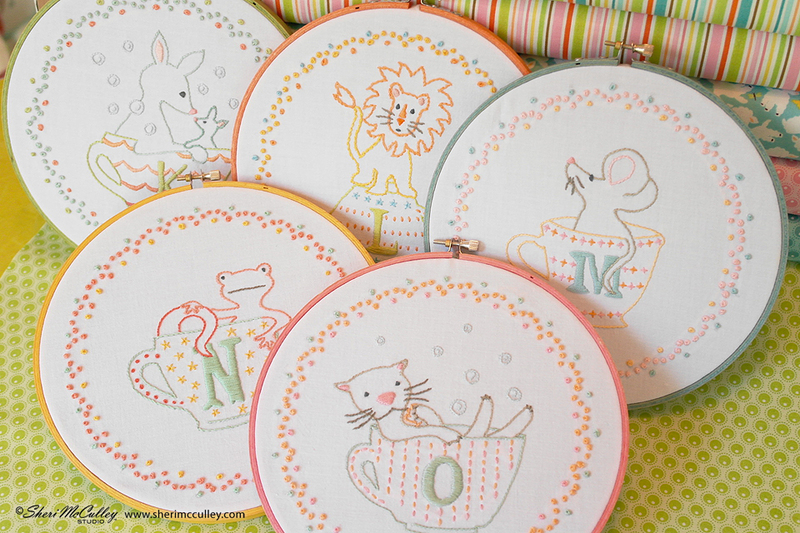 In the meantime have those hoops and colorful flosses ready to come stitch with me from A to Z!